Having lived in London, and New York (see my other review on Colors of New York), I was extremely keen to review these books. The story told much of what I recall about this great city, and the wonderful pictures brought it all home. With so much incredible history to London, which seems to be ever-changing and evolving, Colors of London is a fantastic portrait of one of the best cities in the world. The traditional red mail boxes, red telephone boxes, and red buses are synonymous with London. Not only is the ethnic make up of the city so colorful, but the markets are like bright rainbows down many of the little streets. I loved to walk around the city (it's too big to do it all on foot) and take in the sights and smells. Pubs, too, are synonymous with this city and I loved the pub signs on pages 28/29. Whether you like everyday or really upscale "things", London has them all and they're beautifully depicted with exciting photographs. The essence of the city is truly represented in this book and would be at home on anyone's coffee table. From fashion, food, restaurants, stores, streets, people, statues, traditional landmark plaques, architecture in general, the bridges and churches, to the exquisite details in all its glory, makes this book superb. If you can't get to London, this is the next best thing. 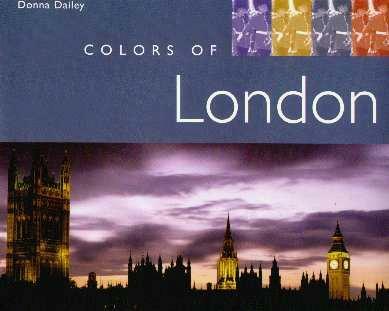 Colors of London may be purchased and/or ordered through your local bookstore. Conclusion - A superb addition to your library. A must-have book for travel lovers.